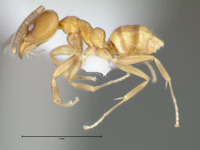 The genus Linepithema has a primarily Neotropical distribution. One species, L. humile, has been carried around the world with human commerce and is considered an invasive species in Mediterranean climates worldwide. They feed as scavenger and predators, honeydew-feeding is widespread. 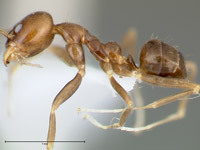 Colonies are populous and many species build polydomous, ephemeral nests in the leaf litter and soil. 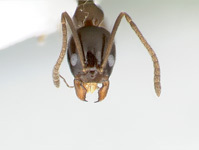 These ants are often collected but lack nice & easy characters for identification. Instead you find continuous morphological variation among individuals and species. Alex Wild (2007) revised the genus for the first time and provides a solid foundation for further taxonomic and ecological studies of the genus. Mesonotal dorsum with deep, step-like mesal impression; dorsum of head posterior of clypeus with > 5 erect setae; mesopleura and metapleural bulla lacking pubescence and strongly shining. According to Wild (2007) L. iniquum exhibits considerable variation in size, color, propodeal form, pilosity, and pubescence. Characteristic for this species is the step-like impression in the dorsal outline of the mesosoma as e.g. this specimen on AntWeb. All specimens below key out to L. iniquum but there is quite some variation in the strength of the "step". The mesothorax at the constriction is always narrower (in lateral view) than the diameter of the fore coxa. For L. iniquum in the Mata Atlântica Wild (2007) notes that: "Atlantic forest material from Brazil presents a more confusing array of variation, as specimens can be small to large, with scapes of varying length, pale yellow to black or bicolored, and sparsely to densely pubescent, with little apparent geographic pattern to the variation and occasional local sympatry of more than one form. A dark densely pubescent form, a yellow sparsely pubescent form, and intermediates have been recorded in sympatry at Nova Teutônia, Santa Catarina. A dark sparsely pubescent form, a yellow densely pubescent form, and a bicolored form are all recorded from Rio de Janeiro and São Paulo states, sometimes in local sympatry. Many specimens from Paraná state are bicolored." At Cachoeira reserve I have collected a light brown, a dark brown and a bicolored form of L. iniquum. I have only few specimens available but these can be separated quite easily. I treat them all as L. iniquum at this time. One might speculate that more than one species is hidden under iniquum; at least in the population of the the Southern Mata Atlântica. Below, I present pictures and some notes on all forms to show the variation among individuals of this species. 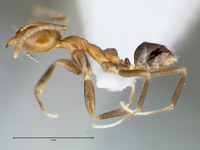 L. iniquum is primarily an arboreal ant. My records are all from leaf-litter samples or baiting on the ground but this probalbly reflects occasional ground foraging. It has been recorded from sea level to over 2000m asl and ranges from Central America to Paraguay and Southeastern Brazil. I have collected this species in pastures, secondary forests and primary forests (though different forms in each habitat). 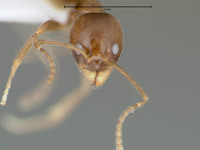 A light brown form with relatively broad heads and densely pubescent. 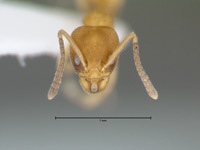 Also, note in the picture of the lateral view the small erect seta on the mesonotum which according to the description should not be there. Only this specimen bears a seta on the mesonotum. Collected in secondary and primary forests at Cachoeira Nature reserve (leaf litter samples). A dark brown form with relatively small heads and sparse pubescence. I have collected specimens of this form only at baits on the ground in pastures. 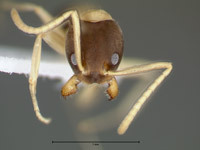 A bicolored form (gaster darker than head and mesosoma) with relatively narrow heads and sparse pubescence. Found in leaf litter samples in primary forests. Strikingly bicolored, dark head contrasting with pale whitish yellow on all or part of the mesosoma and appendages; antennal scapes long (SI 106125). this specimen with the one on Antweb. L. leucomelas is an Atlantic forest endemic restricted in distribution to South and Southeastern Brazil. It has been collected in rainforests and wet forests (floresta ombrofila densa & floresta ombrofila mista). This is an arboreal species. 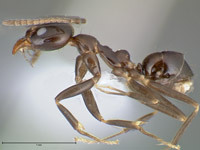 I have collected these ants in leaf litter samples in primary forests at Cachoeira reserve, though this probably reflects occassional foraging on the forest ground. 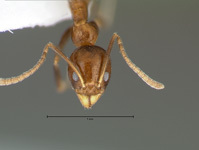 Sculpture on head densely punctate-reticulate, surface dull and opaque; metanotal groove deeply impressed; propodeum raised; gastric tergites 34 with sparse pubescence; size small (HL < 0.65; FL < 0.47); antennal scapes short (SI 87100); body color yellow to reddish brown. adjacent parts of Argentina and Paraguay. It nests in leaf litter and soil. My records are all from litter samples from advanced secondary and primary forests. 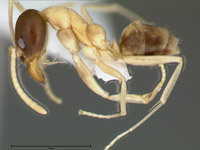 Wild, A. L. (2007): Taxonomic revision of the ant genus Linepithema (Hymenoptera: Formicidae). University of California Publications in Entomology 126: 1-159.